The SX100/185T is the perfect choice for boats where the inside configuration of the boat's stern makes a standard thruster installation impractical. 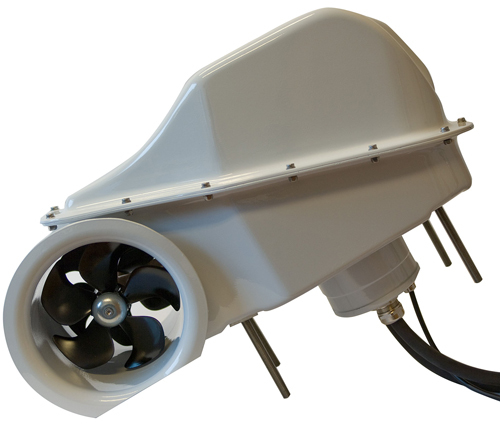 When fitted with the optional cowls, the stern thruster assembly is perfect for boats with twin stern drives. The special cowls enable good performance by diverting the waterflow past the stern drive legs which normally blocks the waterflow and the thrust. Click here to view the thruster spec sheet. Click here to view the SX100/185T spec sheet. Click here to view the SX80 and SX100 installation/user manuals. Pre-assembled thruster unit in a rugged GRP casing for simple external installation. Waterproof and ignition protected: can be installed in gasoline-powered boats. Requires only small holes in the boat's transom for power/control cables and mounting. Serviceable when boat is lifted (refitted with new O-ring seal).